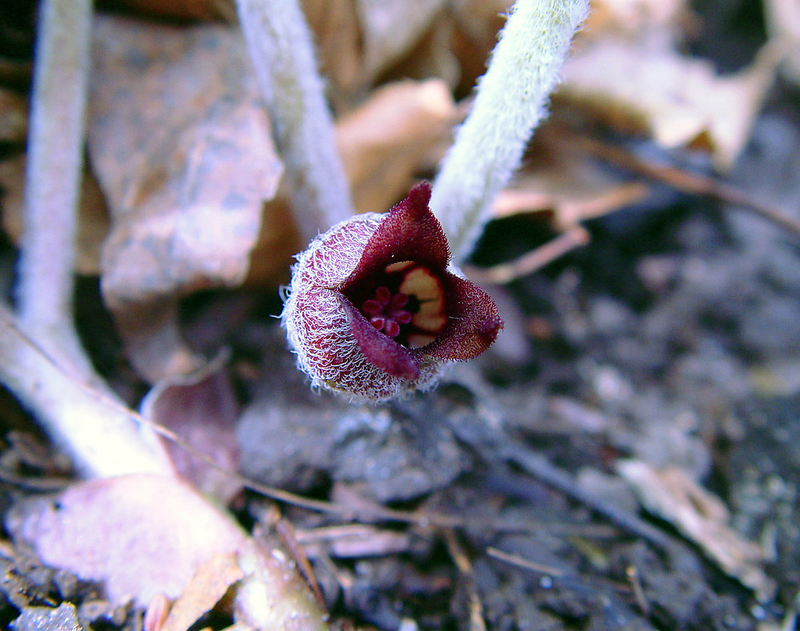 Asarum canadense, commonly called wild ginger is a spring wildflower from the genus Asarum L. and belongs to Aristolochiaceae (Birthwort family). The wild ginger woodland plant is not a relative of culinary ginger, Zingiber officinale, and it is not traditionally used as a kitchen spice. The plant is native to Eastern North America, from the Great Plains east to the Atlantic Coast, and from southeastern Canada south to around the Fall Line in the southeastern United States. Some of the popular common names of the plants are Asarabacca, Snake Root, canadian wild ginger, Canada Wild Ginger, Wild Ginger, broad-leaved Asarabacca, Canada Ginger, Cat’s Foot, Colic Root, Coltsfoot, Heart-Leaf, Indian Ginger, Namepin, Snakeroot and Sturgeon Potato. 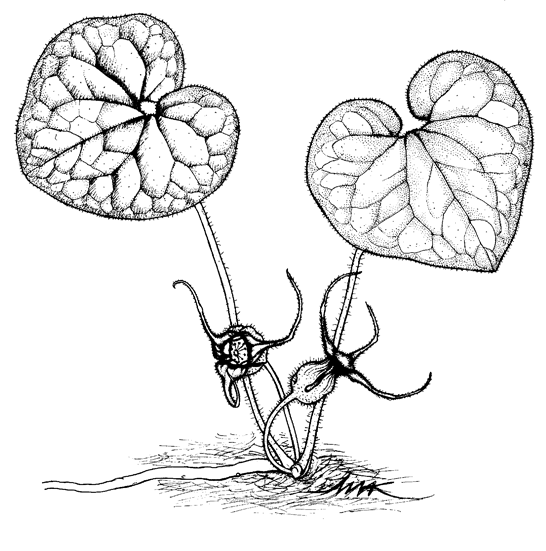 Scientific name Asarum canadense is more unclear. 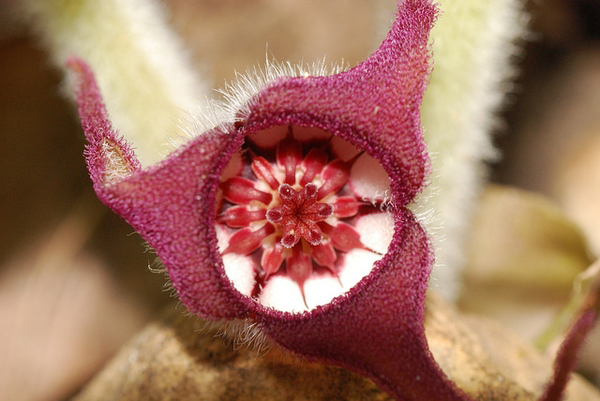 Asarum is a Latin word whose original meaning is unknown. 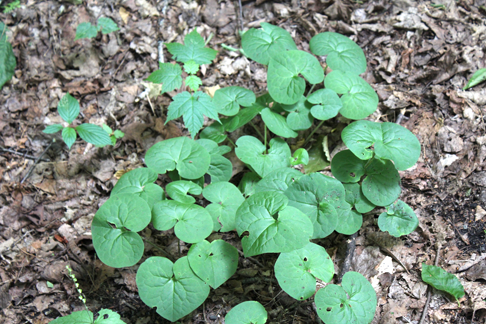 Dictionaries have defined the word as “wild foalsfoot” or “wild spikenard”, which may refer to the shape of the plant or its foliage. Canadense means “of Canada”, which has led to another common name for the plant: Canada Ginger. 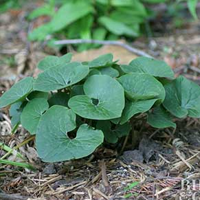 Wild ginger is a low-growing herbaceous, perennial woodland wildflower that normally grows about 0.5-1 ft. (15-30 cm) tall and 1-1.5 ft. (30-45 cm) wide. The plant is found growing in deep shade in moist pine woods, redwood forests, and understory of conifer forests, usually in mesic or wet places. The plant is easily grown in average, medium to wet, well-drained soil, in part shade to full shade. It also prefers constantly moist, acidic soils in heavy shade. The plant has small, creamy white rhizomes, relatively spindly, and aromatic, with a spicy ginger aroma. Stem is pubescent. Fresh or dried roots were used by early Americans as a ginger substitute, but the plant is not normally used today for culinary purposes. Each plant has a pair of basal leaves on stalks up to 6 inches long. Leaves are heart to kidney shaped with a pointed or rounded tip and a deep cleft at the base, the underside densely covered in soft hairs. The leaf stalks are gray-white, also densely covered with soft white hairs. On a mature plant, leaves are 6 to 8 inches long and wide, but are less than half that size when the plant first blooms. When leaves first emerge they are folded up and flat like a book, but unfurl within a couple days. Unlike most plants, leaves of Wild Ginger totally cover its beautiful flower. Beneath the dark green leaves are small flowers that are dark red or purple-brown on a short stem. Flower is in full bloom from April to June. Flower is tubular/bowl-shaped with 3 dark red to brown triangular petal-like sepals with elongated tips. Tube is ¾ to 1 inch across. The flower is up to 2 inches across from tip to tip. The inside of the tube is creamy white; in the center is a ring of 12 stamens around the 6 reddish brown styles. The outside of the tube is covered in long white hairs, especially near the base. A plant has a single flower that lies on the ground at the base of the plant. 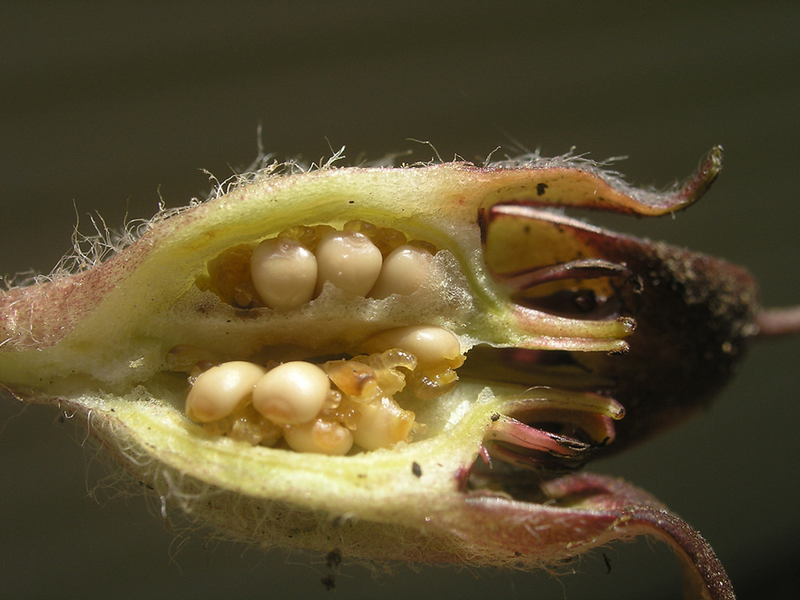 Fertile flowers are followed by a 6-celled fleshy seed capsule. 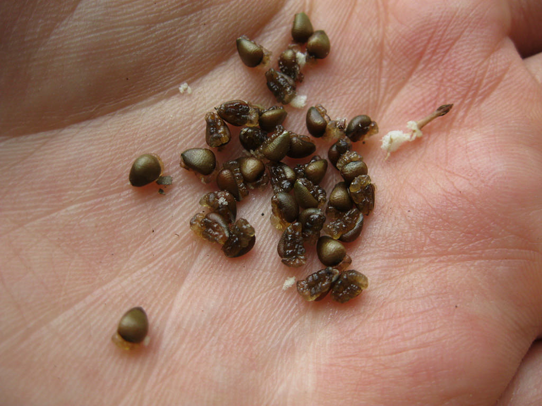 The capsule consists of numerous dark brown, somewhat 3-sided hard seeds. While plants can be started from seed, it takes a while. For germination, seeds need a cold moist storage period of 60 to 90 days, then a warm moist period of the same length followed by another cold period. 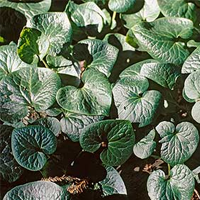 The plant is native to the Pacific Northwest; Asarum caudatum has somewhat glossy deep green leaves and attractive rust brown flowers during spring. 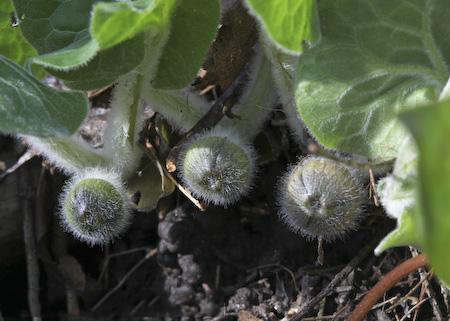 Asarum canadense is a North American native with medium, green downy leaves. It needs regular moisture to look its best. It has better heat tolerance than European wild ginger. 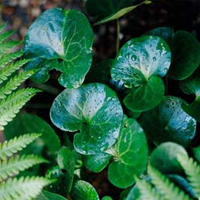 Asarum splendens is an easy-to-grow Chinese wild ginger that is evergreen in mild climates. It has arrowhead-shape leaves with silver mottling and dark purple flowers in spring. 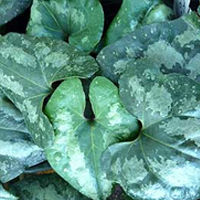 Asarum europaeum bears striking evergreen leaves that have a glossy sheen. Wild ginger consists of good amount of Beta-sitosterol, and this substance, help to lower cholesterol level. As a result Beta-sitosterol can be used to prevent coronary heart disease, which the main reason of high cholesterol level in the body. Unfortunately, there hasn’t been any proof about this substance preventing coronary heart disease, yet this has been proved to be effective in lowering cholesterol. Limonene, found abundantly in wild ginger, is also found in other plants when they are formed in essential oils such as Basil essential oil, orange essential oil and Brazilian Peppertree essential oil. Those essential oils containing limonene are said to be effective in reducing stress and anxiety. However, the limonene found in wild ginger is still a good substance to take the benefits. Wild ginger is good in treating inflammation; amazingly this plant is great in relieving pain too. Some research showed that limonene present in wild ginger can reduce the pain in the muscles and bones, only of mice. Further studies are required so the use of this substance as a pain reliever can be trusted. Wild ginger consists of two anti-inflammatory substances namely bornyl-acetate and geraniol. You might be familiar with geraniol, the substance that has been widely used in various products such as detergents, perfumes, lotions and soaps, due to its sharp aroma. The use of geraniol and bornyl-acetate as anti-inflammatory properties are mostly found when they are used in essential oils. Considering that wild ginger is not used that way, the result might be different and more studies are required. Geraniol found hugely in wild ginger can be used as an insect repellent to keep the bugs away from your garden. Although this has been widely used by manufacturers in chemical products, you can make a natural insect repellant at home using wild ginger. Use the decoction as insecticides or bug repellent is quite handy, but when you apply it to your body the scent might be strange enough as it has a strong aroma, which is not really welcoming to many people. However, this spray can be much safer than those chemical bug repellent products out there. 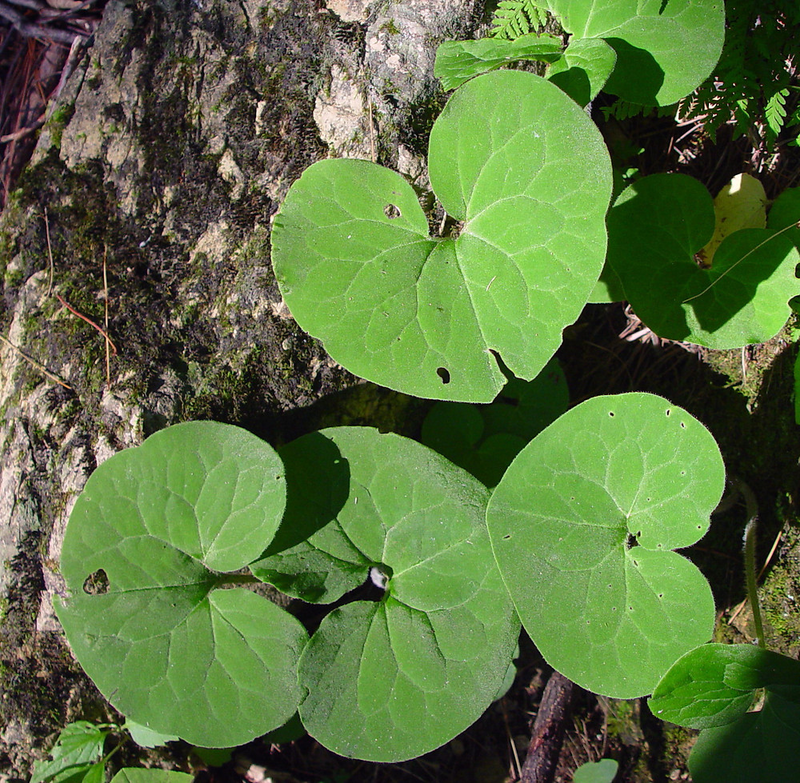 Wild ginger has been used as beverage to add flavor to herbal teas. It just needs to be steeped in boiling water to be consumed as tea and provides many benefits for your body, one of them is for warming it up during the winter. It can also relieve colds, cough and flu, just like the health benefits of red ginger. 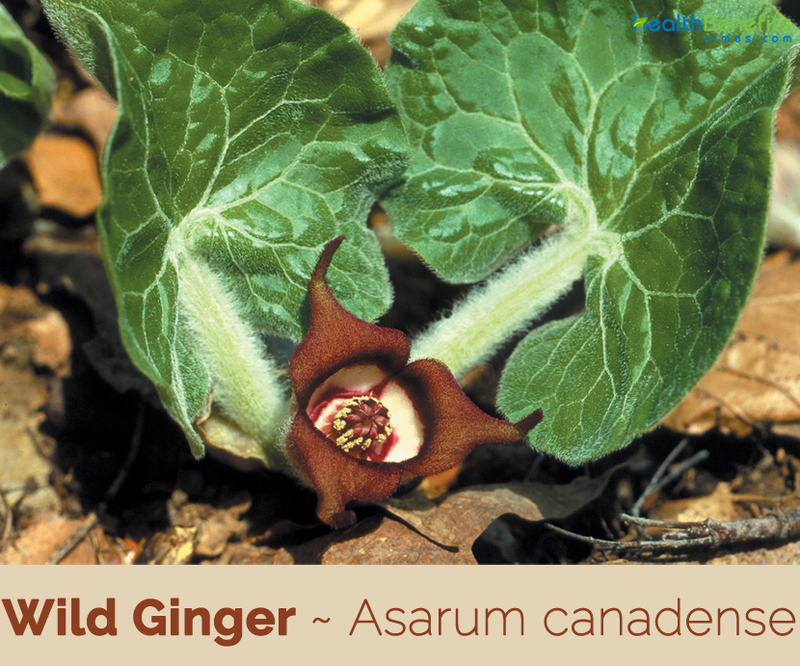 Wild ginger can be used for treating open wounds due to the antibiotic contained in the roots. They are chopped up and used to relieve skin inflammation as a natural remedy. There is no research or study about it, but if you are not sure then just don’t try using it. Not only inflammation, but also burns and wounds can be treated since there is substance called beta-sitosterol in wild ginger. Wild Ginger was widely used as a medicinal herb by a number of native North American tribes who used it to treat a wide range of ailments. Root is anthelmintic, carminative, diaphoretic, diuretic, expectorant, irritant, powerfully stimulant, stomachic and tonic. It is used in the treatment of chronic chest complaints, asthma, coughs, colds, dropsy, painful spasms of the bowels and stomach, scant or painful menstruation, infantile convulsions. Fresh leaves are applied as a poultice to wounds and inflammations, whilst a decoction or salve is applied to sores. Root consists of antibiotic substances effective against broad-spectrum bacteria and fungi. It also consists of aristolochic acid, which has antitumor activity. Root and rhizome were slowly boiled in a small quantity of water for a long time and the resulting liquid drunk as a contraceptive by the women of one N. American Indian tribe. Native Americans used the plant as a medicinal herb to treat a number of ailments including dysentery, digestive problems, swollen breasts, coughs and colds, typhus, scarlet fever, nerves, sore throats, cramps, heaves, earaches, headaches, convulsions, asthma, tuberculosis, urinary disorders, and venereal disease. They also used it as a stimulant or appetite enhancer, and as a charm. Acrid and drying aromatics of wild ginger rhizomes create a warming plant medicine in teas and tinctures, as well as in topical massage oil blends for muscle rubs. Use tinctures of wild ginger in bitters blends to support digestion as a carminative. In an oil infusion, combine it with cayenne, goldenrod, spicebush, and turmeric to stimulate circulation and ease muscle aches and pains. Roots of the wild ginger are dried and boiled to promote bowel movement, ease stomach pain, and are used as an overall tonic. Decoction can also be used to treat headaches, knee pains, boils, and skin infections. Meskwaki steeped crushed rhizomes and poured the liquid into the ear to relieve earache. Abnaki used a decoction of the plant in combination with another plant for the treatment of colds. Iroquois used the roots to treat scarlet fever, colds, urinary disorders, and headaches. 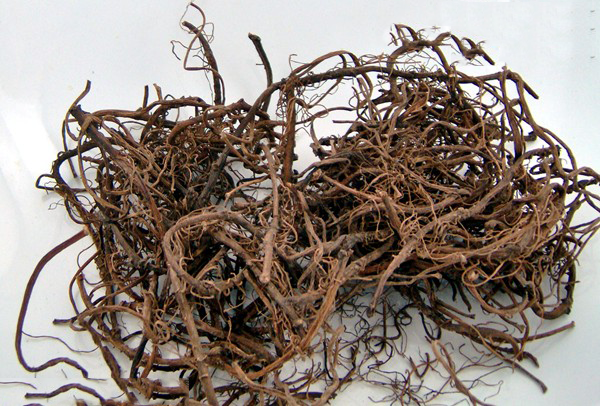 Roots were used to treat coughs, colds, heart trouble, and blood medicine. 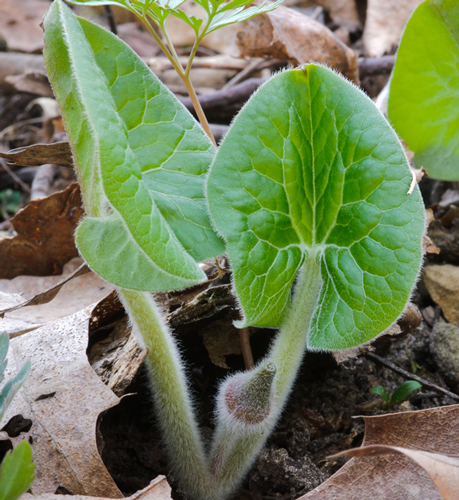 Menomini used the fresh or dried roots of Canadian wild ginger as a mild stomachic. Underground stem and the flowers are used as a ginger substitute. Root, especially when quite dry, has a pungent, aromatic smell like mild pepper and ginger mixed, but more strongly aromatic. Long rhizomes of A. canadense were used by Native Americans as a seasoning. Leaves can be used as a tea substitute. 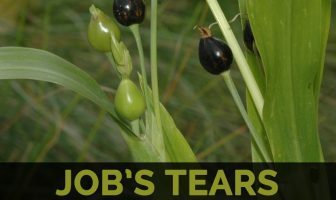 Ojibwe used the roots of this plant as an appetizer by putting it in any food as it was being cooked. Potawatomi used the root to flavor meat or fish and render otherwise inedible food, palatable. Slightly roasted root can be ground into a powder and then sprinkled onto clothing for perfume. It is a useful ground cover for a shady position so long as it is not dry, spreading by its roots. It was also used as an admixture to strengthen other herbal preparations. This plant was named for its aromatic rhizomes which give off a ginger-like flavor. Flies escape the cold by hiding under the Wild Ginger canopy of leaves. 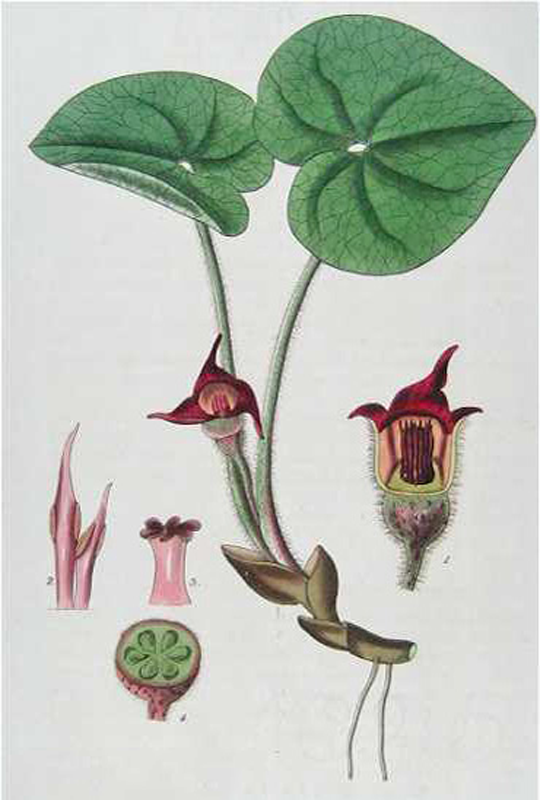 Early Euro-American settlers used Wild Ginger in sugar water to make syrup for their pancakes. However, this is not recommended today because Wild Ginger contains poisonous compounds. When the root was chewed and the fisherman used the spittle on the bait, it enabled him to catch catfish. 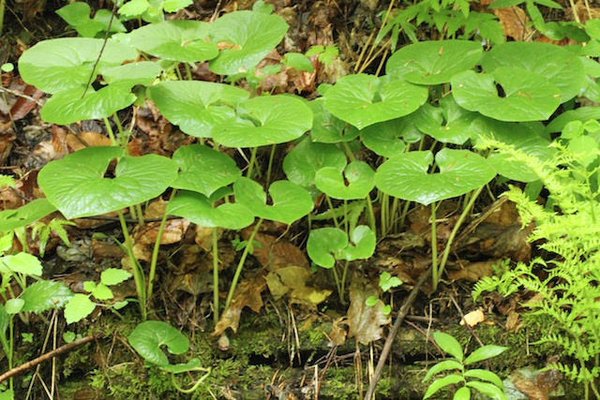 Root of wild ginger holds the ground firmly and can prevent erosion. Handling the leaves is said to cause dermatitis in some people.